VISALIA – It’s hard to find ways to enjoy the intense summer sun in the Valley if you don’t have a pool in the backyard. There’s no where to relax with a book and a beer, or wine and wifi as your children bask in the free time of summer. That will change by next year. 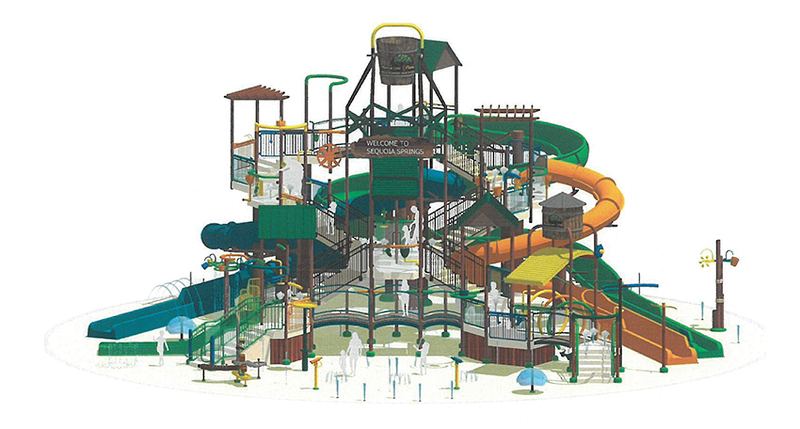 Adventure Park will add a massive water slide feature catering to young kids to its list of attractions by next spring and will have a lounge for parents to watch, and whet their whistle, without having to get soaked or sunburned. At its Nov. 13 meeting, the Visalia Planning Commission approved the park’s plan to remove the “fast track” go-cart racing and replace it with 39-foot tall water feature including water slides, douse buckets and a splash pad designed by Aquatic Design Group in Carlsbad, Calif. and manufactured by American Water Company. The water play structure will be installed by Splashtacular and is scheduled to open sometime in spring 2019. Mike Robinson, owner of Adventure Park, said the water feature is a $3 million investment into the family fun center. The project also includes tripling the size of the building at the fast track course to 2,475 square feet as a check, food service and lounge area for guests using the water slide area. There will be outdoor cabanas and inside seating area that is air conditioned where beer and wine will be served. Only food and drink purchased within the water feature area will be allowed in those areas. Alcohol sales within the lounge and cabana areas will be limited to the hours of noon to 7 p.m., with the exception of special events. Patrons will be limited to four alcoholic drinks per visit. No food or drink of any kind is allowed on the water feature. The sale of alcohol will be completely prohibited during school events, such as Sober Grad Night. Beer and wine will continue to be sold in the existing restaurant area inside the main building of the family fun center. Food and beverages will not be served in the cabana area or lounge when the water feature is closed. “It’s been seven years since we’ve had beer and wine and we haven’t had one police response for alcohol in that seven years,” Robinsons said. Robinson said he plans to hire an additional 30 employees to oversee the water slides, monitor alcohol consumption, and handle security during its peak season in the summer. Adventure Park currently employs about 47 young adults throughout the year. “We have 53 cameras on our site and we just had a staff meeting about selling beer and wine during the holidays,” Robinson said. Planning Commission chair Bret Taylor said he has witnessed first-hand the care that Adventure Park takes when dealing with alcohol during a special event he attended there. “I witnessed you deny someone alcohol because they didn’t have a [driver’s] license,” Taylor said. Commissioner Marvin Hansen motioned to approve conditional use permits to allow for the water feature and to expand the sales of beer and wine to the cabana and lounge areas of the water feature. Commissioner Chris Gomez seconded the motion which passed unanimously.